Compressed air is an important provider of energy for industry; what is often overlooked however is the need to provide quality treatment for this air. 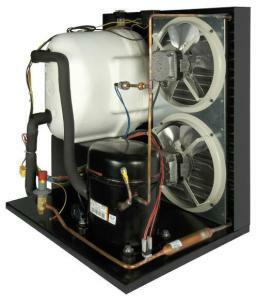 Compressed air contains condensate which, when cooled, will turn into water, causing extensive damage to both the compressed air network and the finished product itself.Domnick hunter Starlette Plus refrigeration dryers actively remove this condensate to achieve near perfectly dry compressed air. The benefits are notable: less system downtime, reduced costs and maintenance, and an improved finished product. 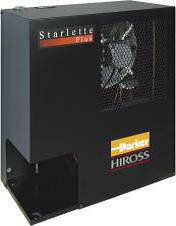 Starlette Plus, thanks to its SmartPack heat exchanger(patent pending) and the most compact dimensions on the market, will prove a major asset in your factory. Reliable airtight piston compressors which do not require preheating. vigorous quality testing in production. Security protection in the refrigeration circuit, increasing reliability and safeguarding the air dryer. Simple disassembly, with easy access to the internal components for efficient maintenance. Drain positioned in a niche, allowing easy access without the need to remove the top panel.